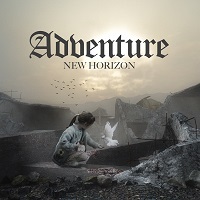 Melodic Prog Rockers ADVENTURE from Trondheim, Norway, are ready to release their new album “New Horizon” on Apollon Records and its sub-label Artemis Prog Records! The band was founded by guitarist Terje Flessen and keyboardist Odd-Roar Bakken in 1995, singer/keyboardist Elen Cath Hopen and bassist/singer/producer Terje Craig during the recording of “Caught In The Web.” Drummer Alf Helge Lund joined the band in the autumn of 2014, and lead singer Kjell Myran joined in September 2015. The writing and recording of this new album began late 2015 was completed in March 2018. The album was mixed by Terje Craig at Craigtones studio and mastered by Jacob Holm Lupo. The album features two guest artists: Atmasukha Ananda managed to squeeze in time to record on three tracks in the midst of his hectic schedule as a classical pianist. Flutist Kine Wallum contributes on three tracks plus on one of the bonus tracks. Kine is daughter of the legendary PRUDENCE frontman Prikken Wallum who passed away in 1990. “Slow Fanfare” lead off the album; a clean and bright keyboard song, done with a tender touch. “Destiny” is a bit on the darker side, with old-school keys and vocals that remind me of early KANSAS. The lead guitar parts are a bit on the sad side at times with hope in hands. “Horizon” opens with warm piano notes and solitary and slow male vocals, before the main riff makes a semi-dramatic entrance. I guess it could be considered a ballad of sorts. “We had it all…we had it made…but now it’s gone.” But, then they talk about “a ray of hope” and “what will tomorrow bring,” ushering in some hopeful elements to the doleful sound. “Eireen (Goddess of Peace) brings more of that 70’s style keyboards, thick with vibrato for that outer space sound. The sound is again fairly depressive, with a lot of minor chords used, and a sense of the ominous. “You Belong” opens with mostly positive and hopeful tones, and a nice bass guitar line. Soft acoustic guitars and harmonized vocals take over from there, with a little lead guitars and keys sprinkled in here and there. The constant push and pull from hopeful to hopeless is noteworthy, but they don’t venture too far from it. “With Tears in their Eyes” is a short instrumental with soft flute notes and a promise from acoustic guitars. “Lighthouse” is another slower song where the melancholy hangs in the air throughout. The flute croons away as the vocals and keys soon join in. What is lacking mostly here is texture. “Here to Stay” opens with a conventional guitar riff and the roar of keyboards. Female lead vocals bring an element of positive energy to the sound, but it remains pretty murky. “Nothing will Change” is a shorter declaration for accepting things as they are. The message is staying positive about things that you have no control over. When all things are considered, I’m not sure I am listening to a Progressive Rock album here. But, that is neither here nor there. Most song suffer from the “mid-tempo” blues as I call them…too many with that same, lumbering pace which is unfortunately not very exciting, and there are not enough peaks either in the vocals or the instruments to counter balance this. The musicianship is just fine, but they really struggled to get this album off the ground.